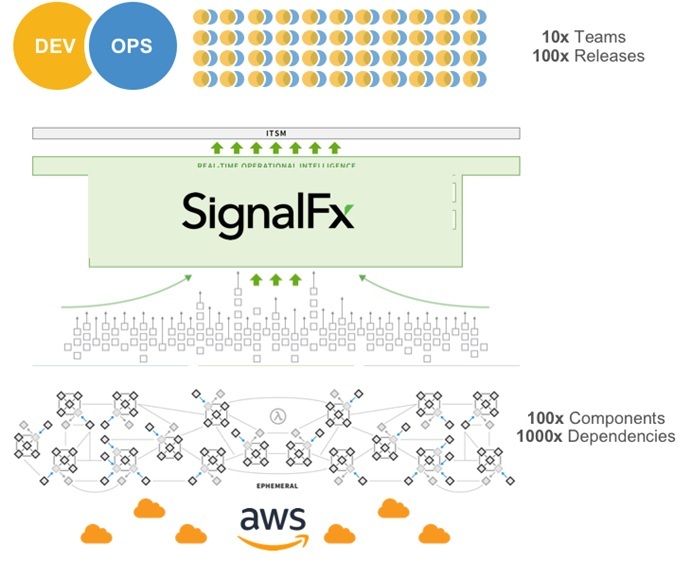 SignalFx, an AWS Partner Network (APN) Advanced Technology Partner with the AWS DevOps Competency, provides Amazon Web Services (AWS) customers with a real-time monitoring solution supporting every stage of the cloud journey. SignalFx offers a consistent, comprehensive view of your elastic, distributed environment; noise-free, actionable alerts on all classes of metrics powered by real-time analytics; and the operational intelligence—including workload and usage patterns—to run your digital applications as a business. Before diving into the details of SignalFx, I’d like to highlight some key DevOps concepts and why adoption of SignalFx by large AWS enterprise customers is proof that cloud monitoring and intelligent alerting are key to an effective digital transformation. As organizations focus more on technology, they often find traditional development models slow and somewhat burdensome. Enterprises must be able to innovate and go to market quickly, react faster to customer feedback, and iterate on their existing portfolio. To keep up with this fast pace, IT can provision new resources as development requires. Operations and product management can relay customer experience back to development to produce useful enhancements. DevOps enables this kind of transformation by changing the structure of the development teams—making them more agile and giving them complete end-to-end visibility, from the design and build to the operation and optimization. Supported by tooling and automation, teams can spend more time focused on improving the user experience while reducing the time they spend on operational overhead. Instead of a development team owning a large number of products across an entire organization, they can streamline efforts to focus on a small set of objectives and take ownership of positive outcomes for their business and customers. As organizations start to decouple services and leverage containers and ephemeral architecture, it becomes essential to have visibility into the entire technology stack, including the underlying infrastructure. SignalFx empowers developers by providing that monitoring interface for DevOps teams. Figure 1 – Reduce risk with monitoring shared across Dev and Ops. With SignalFx, DevOps teams are agile in their troubleshooting and can easily share information. They monitor and communicate using a common platform. The risks from rapid innovation are mitigated by enabling real-time visibility from every layer of the application through a single source. Reacting before issues affect your customers with instant visibility across all of your systems at 1-second resolution and 1-second latency. Breaking down communication barriers between cross-functional teams using one source of information. Sharing dashboards and information in a collective effort without losing the original insight. Avoiding finger pointing and shortening feedback loops with real-time and historical data from across your environment. React to problems faster with the alerts you need. Evolve your alerts to capture what’s changed and eliminate noise and alert fatigue with conditions that reflect the reality of cloud architected applications. Automatically discovering and monitoring new services and systems without manual configuration. Monitoring any combination of incoming data and derived metrics, including percentile, variance, and rate of change. Describing any desired alert condition with dynamic thresholds, flexible trigger/clear conditions, and multiple severity levels. Receiving alerts within seconds instead of minutes. Reducing the iterative trial-and-error process by tuning alerts to your specific condition. SignalFx identifies anomalous behavior in your applications so you know where to focus your attention. Determining the best alert conditions in cloud environments can be a complex process, which is why SignalFx includes pre-built alert conditions and capabilities designed for cloud operations. This saves time when setting up and operating applications. Correlating metrics from every layer of your cloud application to understand how dependencies impact performance. Visualizing whether service-level behavior is normal compared to its historical performance and relative to other groups and services. Spotting outliers as they happen and pinpoint uncharacteristic behavior prior to any issue. SignalFx helps create a source of intelligence to eliminate silos so your organization can communicate, remediate issues, and preserve SLAs. Learn from the experiences of peers and retain the expert knowledge. Shortening time to insight with production-ready dashboards for a breadth of integrations. Leveraging SignalFx field-tested alert templates and pre-packaged alert conditions as a starting point for your specific use case. Creating easy-to-maintain, templated content and enable adoption from a centralized team. Figure 2 – Real-time operational intelligence platform with SignalFx. Cloud services, open-source technologies, and microservices architectures enable only part of a high-velocity release cycle. Organizational structure and release cycle processes are the foundation for enabling a “move fast without breaking things” culture. DevOps enabled by SignalFx enables a safety net with the right level of shared visibility across teams for every component of your cloud app. SignalFx empowers developers and the transformation to a more DevOps-focused development. Having insight into your infrastructure, services, and applications in real-time is a must for organizations today, and SignalFx helps you stay ahead of operations. To learn about some of the ways you can be productive in SignalFx almost immediately, follow the steps in their 15-Minute Quick Start. You may also be interested in our on-demand APN Partner Webinar Series featuring SignalFx. Learn how Acquia, a Drupal web experience provider, consolidated the number of monitoring services used, improved the quality of customer services, and saved half a million dollars per year in costs. Get started today with Cloud Monitoring Service from SignalFx, available now on AWS Marketplace. 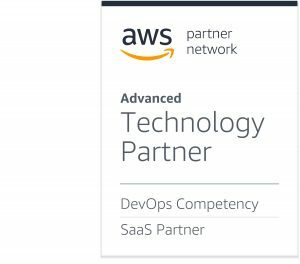 SignalFx is an APN Advanced Technology Partner with the AWS DevOps Competency. They provide an advanced monitoring solution for cloud apps and modern infrastructure that aggregates metrics across distributed services to alert you on service-wide issues and trends in real-time—versus host-specific errors well after the fact—addressing critical application and infrastructure.